Description of Mexican Rain Cape Thatch: Mexican Rain Cape makes it effortless to convert ordinary structures into tropical island retreats with its shaggy fringe thatch exterior and woven knotted interior. Mexican Rain Cape Tiki Thatch Features: Versatile product; can be cut using scissors to any shape between the knots without unraveling. Kind a like cutting a fish net. 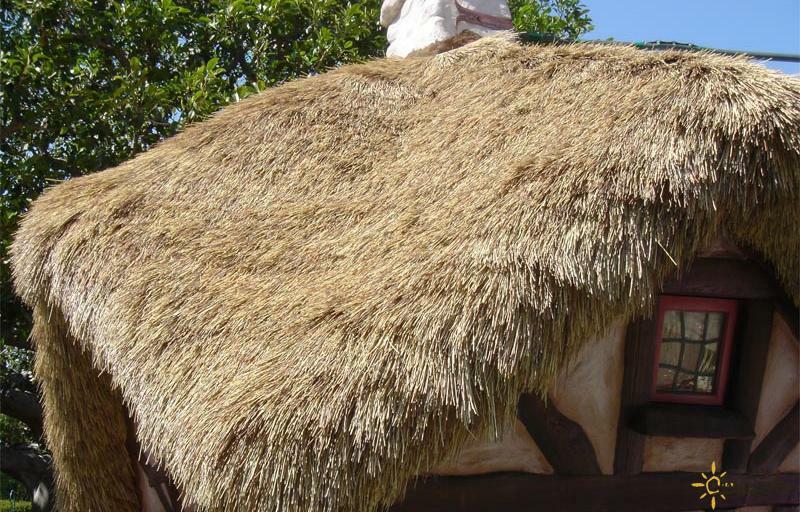 Applications for Mexican Rain Cape Palm Thatching: Apply to a plywood deck with staples or on horizontal 1/2" x 1" batten boards to create a more authentic looking thatched roof. Can be applied directly to batons for a more authentic look. Retail display product stands with a mini thatched roof. 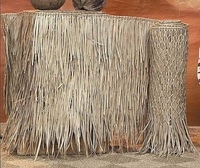 Specifications of Mexican Palm Thatch: Hand-woven palm leaf sheet is for 52" x 30' x 1" thick and weigh 95 lbs each roll. This is approximate measurement. Sold individually in one long thatch roll. Can measure up to 33' long. Longevity: 5-6 years outdoors; indefinitely indoors. Thatch Rolls can be ordered pre-fire retarded for interior or exterior use. Please check our fire retardant thatch rolls. Fire retardants can also be applied on site to installed thatch structure but is not as affective as having us spray it for you. Mexican Rain Cape Thatch Dimensions: 52" x 30' x 1" thick. Each roll provides 100-110 sq ft of coverage. Please allow material for overhang also when calculating thatched material.This is approximate measurement. FAQs about Mexican Rain Cape Thatch: How long can I expect Mexican Rain Cape thatch to last? Our Mexican Rain Cape thatching will last up to 5-6 years in dryer climates outside and indefinitely inside. Is Mexican Rain Cape thatch waterproof? No; Mexican Rain Cap thatch is purely for shade cover and to create a tropical feel for your product. For a waterproof structure multiple layers would be needed. Mexican Rain Cape Thatch Installation: Installation installation emailed by request. No special skills are required to install. Just staple gun with no less than 9/16 staples and scissors are required. Minimum recommended installation pitch is 30 degrees (7 in 12); Longevity will increase with pitch increase.